So, maybe this matters to you and maybe it won’t. If you say you are a Christian who believes the Holy Bible to be the only source for truth and you believe there to be ONLY ONE TRUE GOD and the ONLY way to the Father is through the son of God Jesus Christ and His blood that was shed for all who would receive Him. If you believe that the uniting of all religions is wrong because we DO NOT all worship the same God..the true God, our Creator and our Savior and the Alpha and the Omega. If you are praying for discernment from God Almighty so that you might know who to vote for THEN you might find this statement from Marco Rubio to be eye opening. I had read this a couple of months back and thought it to be a little odd but didn’t dwell much on it. I had been looking up each of the Republican candidates and reading about each one in Wikipedia. Last week at work the girls were talking about Rubio and how he was coming hereto speak and where he would be. It was going to be at a church comments were made about him being a Catholic and so was it a Catholic church. I chimed in at that time and said that I had read he attends both Catholic and Baptist churches. They looked at me like I had lost my mind. I began thinking did I read it wrong as it did sound pretty stupid. Yep, I found it again and I read it to the other ladies. We all differ in our views and myself and one of the others are on the same thoughts and the others actually believe all religions are to the same God and they go to church where the practicing homosexual life is acceptable. Anyway below is the snapshot of what was written. You can look it up yourself. I would like to ask the question. 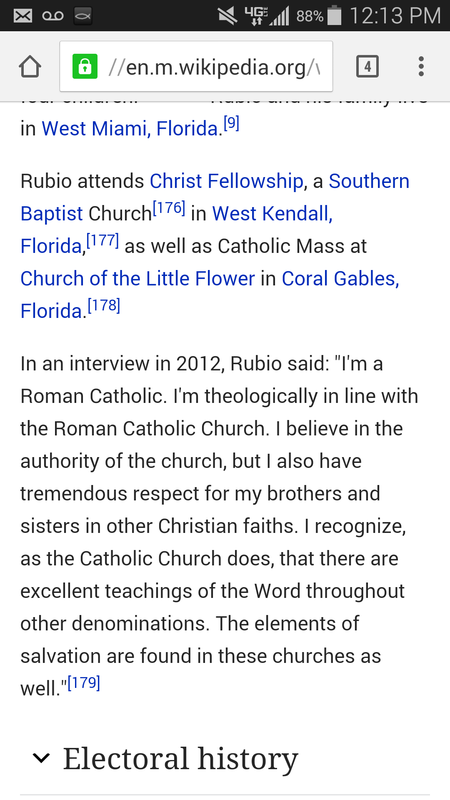 So Rubio sounds good when speaking out about our religious freedom and how he will stand up for Christians but, what is he not telling us if anything? Maybe he is confused. Maybe he uses this for votes. What if he could be used to continue the uniting of a one world religion alongside the pope, if he were to become president? I am not saying anything except to read this and pray for discernment as this is rather interesting. Dear Lord God Almighty, I ask You to give each of Your children the gift of discernment. In the name of Jesus Christ I pray…amen.